Sorry I haven’t been posting much, chaps! I went away last weekend and just haven’t really been cooking much these last two weeks as my food budget got spent on petrol to go down to Salisbury and see my friend who’s about to have her first child any day now! All very exciting but not exactly conducive to cooking. However, here is something I made earlier! This meal is packed full of vegetables and the mealballs are incredibly moreish! I was trying to go for a sort of riff on Turkish food. I definitely wanted lamb in there but tempered with the lower fat turkey to round things out a bit and add a bit of a different taste. I adore the Turkish sides of cabbage etc but decided that for something a little different a coleslaw would work these veggies in but in a new way. The couscous and roasted veggies is just a delicious dish to accompany anything. – Add all of the ingredients to a large mixing bowl. – Use your hands to mix them all together thoroughly until the mixture is combined and rather sticky. – Pinch off pingpong ball sized amounts and shape into balls then place on a very large baking tray with sides (you may need 2 trays). – Bake in the oven for 30-40 minutes, until nicely browned all over. – In a small bowl mix the yogurt, red onion, garlic and salt together to make the dip. 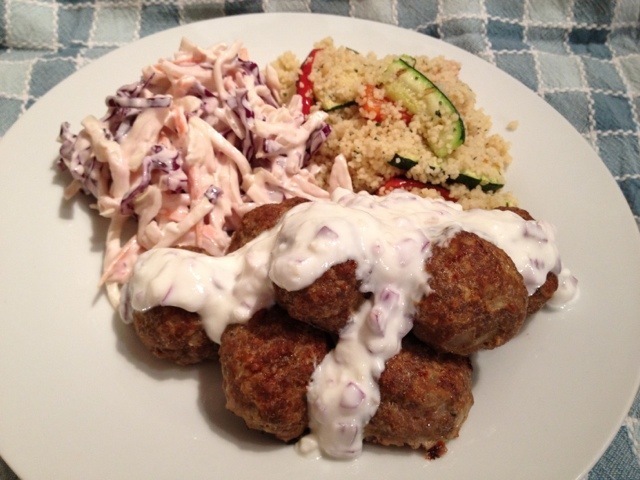 – Serve the meatballs with the yogurt dip. I accidentally managed to make this delightfully green meal on St Patrick’s Day, which just shows what your subconscious can do when you let it! The actual purpose of the meal was so that I could serve something vegetarian but that could easily have meat added to it with neither party losing out of flavour as my sister was coming for a surprise Mother’s Day visit. This fit the bill nicely. I originally got the idea for pea pesto into my head and went searching for inspiration. Smitten Kitchen’s one popped up and I trust all her recipes implicitly… doesn’t mean I can resist tweaking things though! We tend to favour more sauce in my family… or, my Dad does and so we go with it! 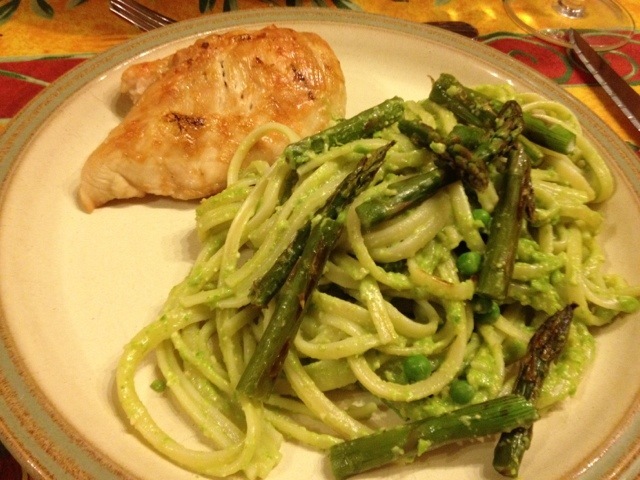 I also thought the addition of asparagus and grilled chicken rounds it out nicely to make it a proper meal. I am on a budget so salted cashews work nicely as you don’t add salt later. And I’m sorry for mixing my units in the recipe but it’s the easiest way to measure each one I find! – Boil a small pan of water and add about 1/4 tsp salt. – Add your peas and cook for 4-5 minutes until they’re floating. – Drain and immediately rinse with cold water. Set aside in a pan of cold water. – In a food processor blitz your cashews until they’re very finely chopped. – Add the peas (reserving about 4 tbsp), parmesan and garlic. – Blitz for about 2-3 minutes until totally smooth, adding the olive oil down the funnel at the end. – To prepare your asparagus, grasp the base of the stalk with both hands and run one hand up the stalk, bending slightly until it snaps off the bottom 1 1/2″ or so. This removes the tough lower stalk leaving you with tender bits. – Grill your asparagus and chicken. I think about 7 minutes per side for the chicken and about 10 mintes all told for the asparagus. I use a health grill for the asparagus and a regular grill for the chicken. 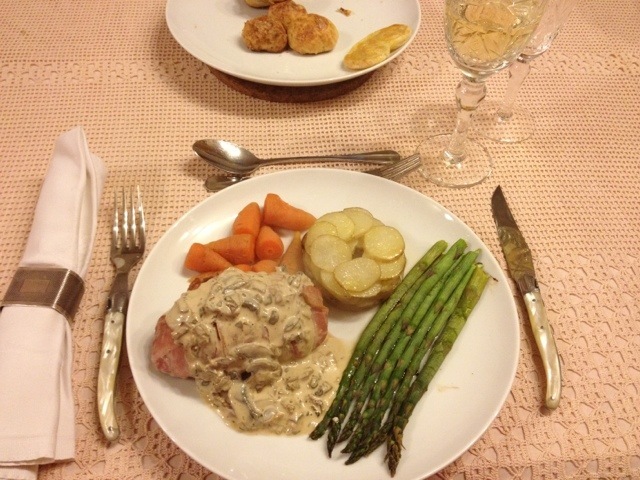 If you only have one, cook the asparagus first then set aside in a warm oven while you do the chicken. – Drain your linguine and reserve about 1/2 cup cooking water. – Toss the linguine and pesto, adding enough water to loosen it a bit. 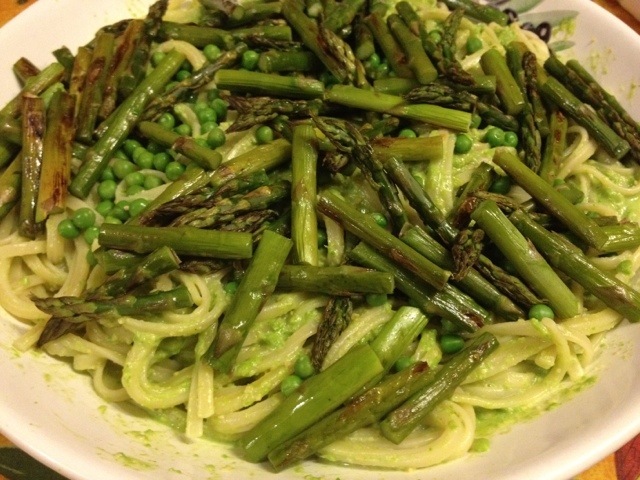 – Scatter the top with the reserved peas and asparagus, cut into thirds. You could also slice the chicken and serve in with the pasta if you aren’t worrying about keeping things veggie. 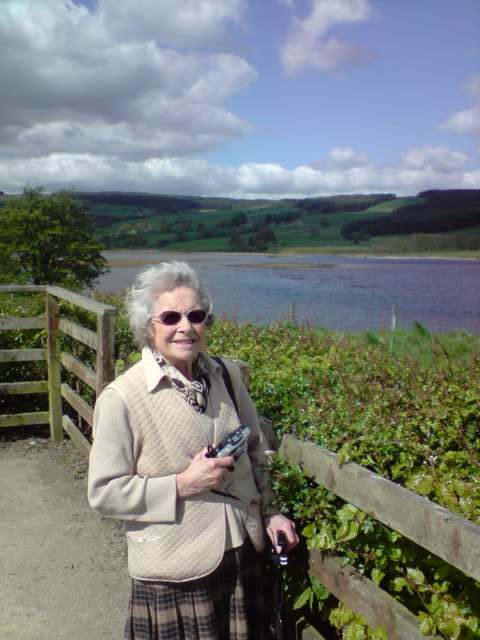 My Gran, Angèle Midgley, passed away a year ago today. I’ve thought of a number of ways to mark the anniversary and this seemed like the perfect way to mark the day. I remember her every day in a hundred different ways but for now I thought I’d focus on my foodie memories of her. She wasn’t one of the world’s great cooks, although her father was a chef, but whenever the whole family assembled when I was a child the dining room table at her house would be crammed with food and everyone would dig in. I remember sitting at that table and learning the ‘correct’ way to eat your soup in the old soup bowls with handles. (Spoon moves away from you to scoop and you sip from the near side.) I remember picking strawberries with her at the pick your own and probably eating my own bodyweight in strawberries! I remember how, when I started to cook, I would take some muffins or scones and homemade jam over to her and we’d have tea. I remember going for drives up Nidderdale and having lunch somewhere, just the two of us. 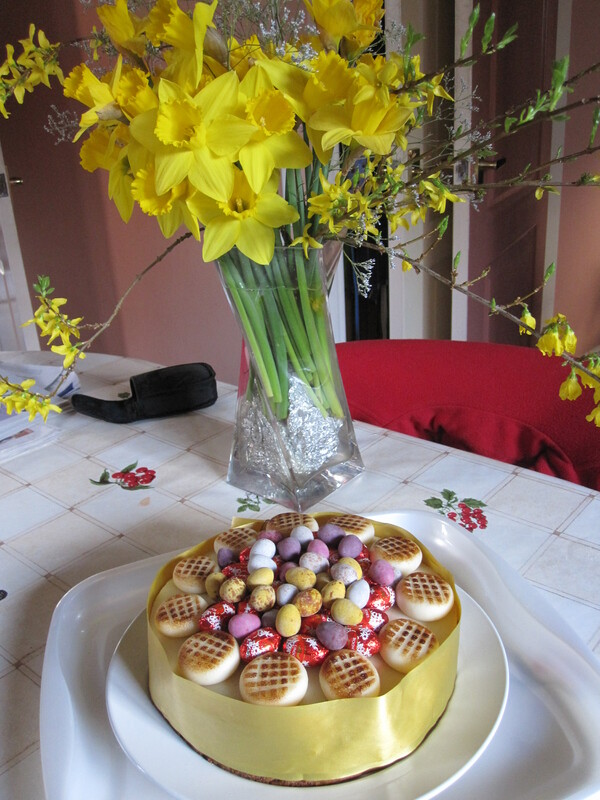 This is the recipe that my Mum uses every year to make a Simnel Cake. This year I’ll be joining that tradition and I too shall be using this copy of the recipe, hand written by my Gran. I’ve uploaded the pdf and I know she’d be thrilled if you were to use it too. A few weeks ago I was approached through this blog to take part in a Chablis Challenge. The premise was simple; they would send me two bottles of Chablis and I would suggest what I thought would pair nicely with the wine. The ultimate prize being a trip to Chablis. Well, I wasn’t going to say no to two bottles of wine was I? My knowledge of wine is limited. I know what I like and I have a basic understanding of the processes involved in making wine but apart from that I don’t really know anything! Chablis wasn’t really something that had come across my radar before. I knew the name and I knew that it was French but apart from that I couldn’t really tell you anything about it. 1. Chablis is a town in the Burgundy region of France. 2. Chablis is made from the Chardonnay grape. 3. The limestone based soil of the region is said to give the wine a flinty note. So, that’s the kind of information that Wikipedia can give you. It doesn’t actually tell you much about the wine itself. The only way to find out that was to drink it! One bottle was duly sacrificed to taste testing and recipe development. The sharpness of the wine to my mind would pair nicely with rich and flavoursome but simple ingredients, something along the lines of the classic French dishes. Chicken, mushrooms, potatoes, butter! Something to contrast nicely with the bright, fresh flavours of the wine so that the overall effect of each was tempered and enhanced. My next thought was that French was too easy, it’s a French wine, so French food was a little obvious, why not go for something different, something unexpected. A mild Thai dish with lots of fish sauce and sharp lime really sprang to mind. Lots of fresh green vegetables and crunch! I think that a fish curry in particular would be a great match and some prawns in there too would be lovely. And then I thought why not find a middle ground? Zesty lemony chicken served with roasted pattypan squash and pasta lightly dressed with a nice peppery olive oil dressing. I tried all of these recipes in turn. Each of them went well and lent itself to a different aspect of the wine. So for the Pièce de résistance, the meal I would cook for my whole family to enjoy, I put it to a vote. Dad’s vote carried the day and French it was! Hopefully my family weren’t just humouring me when they said it was all delicious! We all agreed that the contrast of the richness of the food and the sharpness of the wine meant that neither overwhelmed the other and that the wine was robust enough to hold its own against the stronger flavours but was light enough that it didn’t clash. All in all I really enjoyed this challenge. It brought a new wine to my attention and really made me stretch my recipe development skills trying to come up with flavours that would complement the wine and then adjusting the dish to make each part really shine. 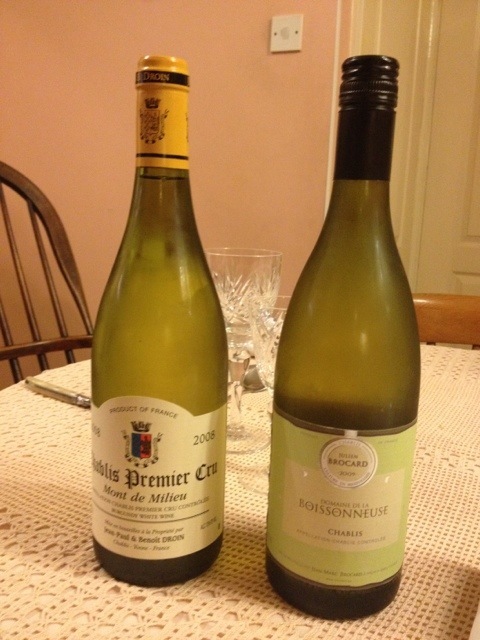 Normally as far as I get with wine matching is to choose a red or a white dependent on the meat! In the future I will definitely pay more attention to pairing the right wine with the right food as the advantages are great. All in all it was an excellent exercise and I shall certainly be adding Chablis to the list of ‘wines that I like’! 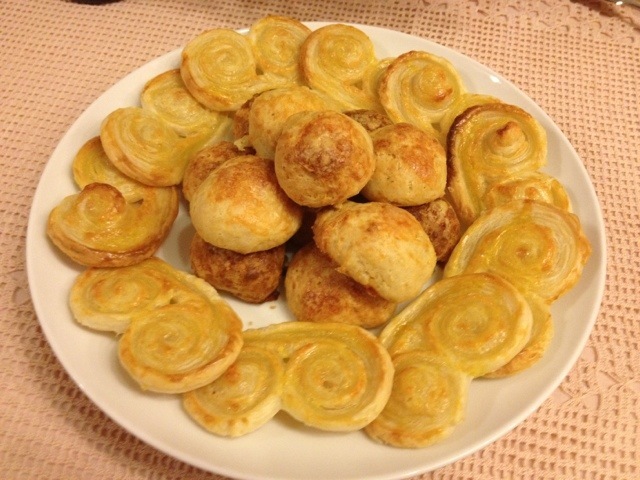 Palmiers are a delicious little nibble that are perfect for a lighter option for a starter prior to a rich meal. I happened to serve these prior to just such a meal last weekend. They are also great as a canape or for nibbles with wine. I first had these at a hotel near Calais as an amuse bouche prior to our meal. Those were rather smaller but the essential elements remain the same, if you did want them smaller then simply cut the rolled pastry in half to make two smaller rectangles and proceed the same way. You can vary the fillings as you prefer to use pesto, a different cheese, sundried tomatoes, proscuitto, whatever takes your fancy! – Roll the pastry out to a large rectangle, about the thickness of a pound coin. Feel free to bash it about a bit. It’s ok to be rough with it in this case as we don’t actually want it to puff up too much. – Scatter the rectangle with cheese (or other filling). 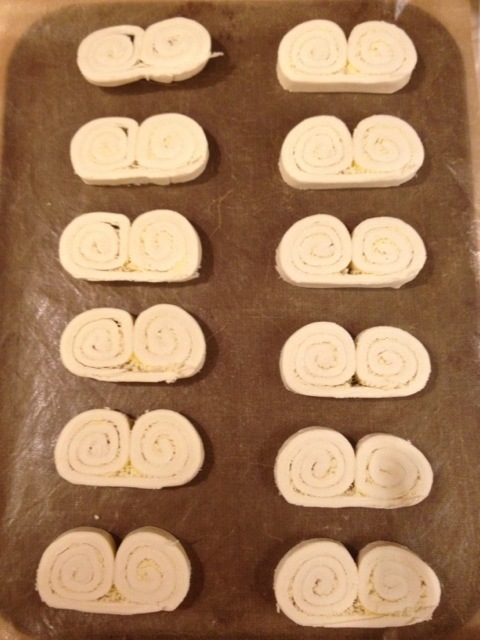 – Then take the shorter ends of the pastry and roll them tightly towards the middle. – Where the two rolls will meet in the middle, brush with the beaten egg to stick them together. – Wrap the roll in clingfilm and place in the freezer for at least 40 minutes. – When you want to cook them heat the oven to gas mark 7/220C and take the roll from the freezer. – Slice into slices no more than 5mm thick and place on a lined baking tray. – Brush with the remaining egg wash.
– Bake for 10-15 minutes until golden brown. If any bits puff up, poke them back down. Another cheesy nibble for you here. 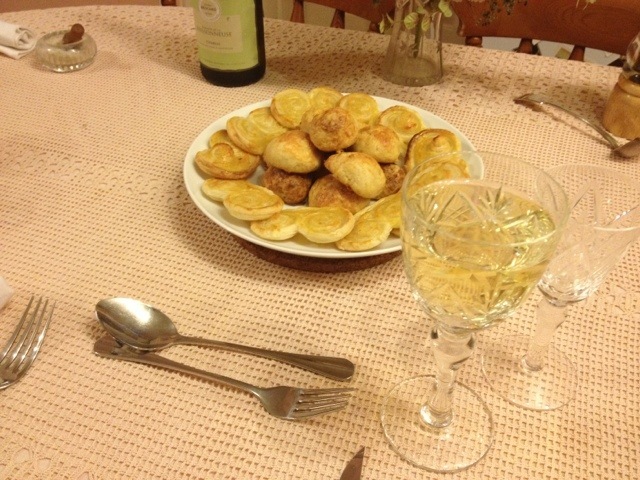 Gougères are also French and also delicious! They also fit the bill for something light but tempting and so, they were added to my French Menu last weekend. I’d had some, very limited and ultimately unsuccessful, experiments with choux pastry a few years back. Luckily, I didn’t let this dissuade me and I threw myslef into making these with no fear… it would have been good if the recipe I had chosen had actually worked! I ended up having to tweak it on the fly because it was, quite simply, rubbish! I’m quite proud of the fact that I am now at the point with my cooking where I can do this. Unexpected results don’t phase me and I can adapt recipes as I’m going along. I think I’ve come a long way! I have to confess that I think they’d be better with some cheese inside them, if you want to do that just split them with a sharp knife, add what you like and then pop the halves back together. – Heat the oven to Gas mark 7/220C and line two baking trays. – Put the water, butter, salt and pepper in a pan and heat until the butter in melted. – Add 1/2 cup of flour and stir vigorously until the mixture pulls away from the sides of the pan and forms a ball. You may well need to add more flour, I certainly did! – When it has formed a proper ball, which doesn’t look wet, remove it from the heat and then leave to cool for a few minutes. – Beat the eggs on a separate bowl or jug. – Once the mixture has cooled add the eggs in about 4 goes, beating thoroughly until it combines to make a smooth batter. You don’t want the eggs to ‘cook’. – The mixture should not be too mobile as you want to shape it into balls, not have it flow away. You can add more flour if neccessary at this point if it’s gone wrong. 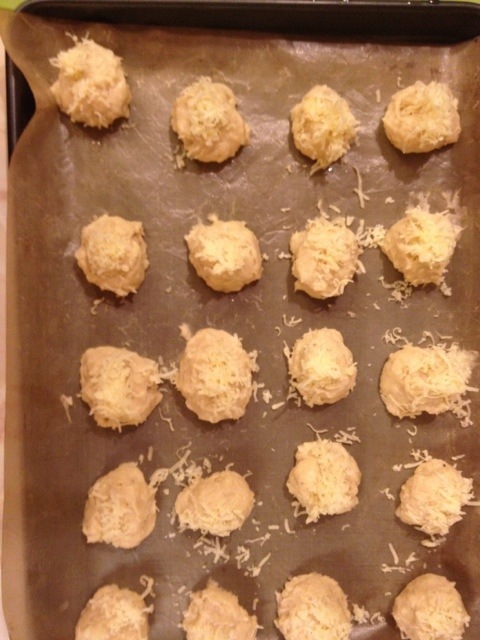 – Add about 90g of the cheese to the mixture and stir through. – Shape into balls the size of a walnut, either by using a piping bag or using two teaspoons to shape the mixture. 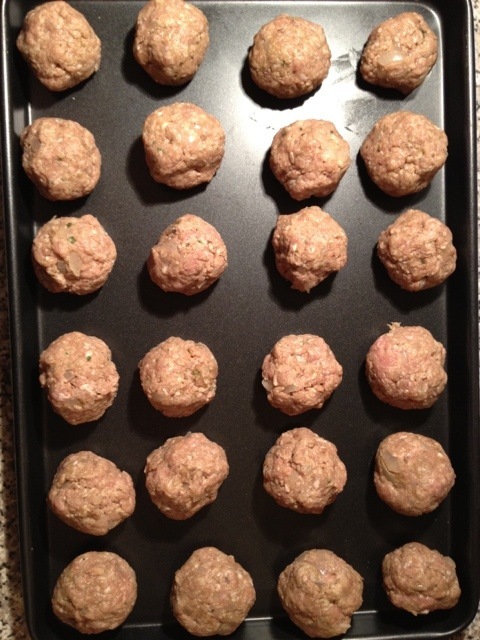 Place the balls on the lined baking trays. – Add a small pinch of cheese to the top of each one. – Place in the oven and bake for 10 minutes before turning to oven down to Gas mark 5/190C and baking for a further 20 minutes until completely golden brown. – Serve warm as they are or split and filled. You can keep them warm in the oven for a little while if neccessary. I am willing to admit that my naming skills aren’t great but this dish is exactly as it sounds. May be we should christen it Chicken Anna or something just to make it sound fancy but I can hardly have been the first person to come up with this idea, surely? It sounds simple enough but it is a little bit fiddly to put together. Nothing complex, but the step by step just takes a little while to prepare, which you know I don’t susually favour. The results are totally worth it though! The earthy umami of the mushrooms is really brought to the fore and the flavour that you get from using chicken thigh, rather than the more popular breast, is wonderful. Proper streaky bacon to swaddle it in and keep all of those delicious flavours together gives it another little flavour burst. Served with fresh vegetables and a rich, creamy sauce I think that this dish will prove very popular in my family in the future and well worth the effort! – Cover the dried porcini in 300ml of boiling water and leave to soak for 15 mins then drain, reserving the liquid, and roughly chop. – Heat a splash of oil in a frying pan and add the mushrooms, seasoning well with salt and pepper. – Cook until starting to brown then add the chopped porcini. – Add the wine and simmer, stirring frequently, until the liquid is gone. – Carefully pour the liquid left from the procini over the mushrooms, being careful not to add any grit. – Simmer, stirring frequently, until all of the liquid has evaporated. – Trim any of the fatty bits from your chicken thighs. – Cover the chicken thighs with some strong cling film and bash the thicker parts of the thigh with a rolling pin to flatten to a more even thichness all over. You want to retain the rectangular shape as much as you can so place your blows carefully. – Place 4 rashers of streaky bacon on a chopping board. Layer them slightly so that they form one sheet. – Place your chicken thigh on top, centre facing upwards. If using several smaller thighs, jigsaw it together as best as you can. – Add a few spoonfuls of mushroom mixture along the centre. You will not use all of the mushroom mixture. You should have at least 1/3 left over. Set aside until you make the sauce. – Carefully pull the chicken thighs up over the mushroom layer. It should just about meet. 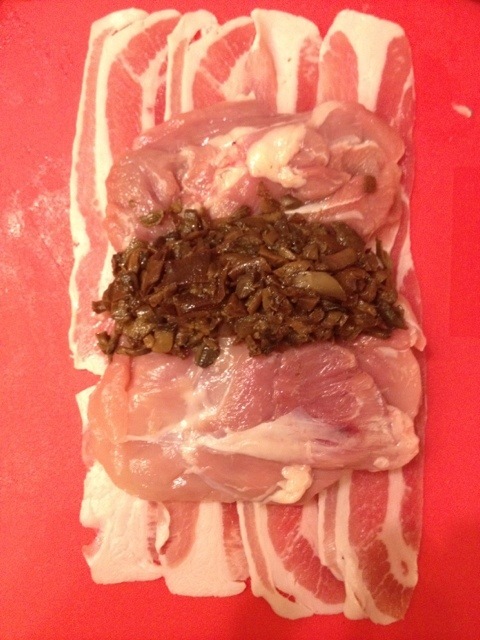 – Then wrap the bacon rashers one at a time around the chicken thigh so that it completely encloses the meat and keeps the mushrooms from spilling out the ends. – Place in an oven proof dish and cook in the preheated oven for 35-40 minutes. You want the insides to be totally cooked with no pink to the juices. – To make the sauce first heat a splash of oil in a saucepan. – Add the sliced mushrooms and a pinch of salt and stir until cooked. – Add the remaining mushroom mixture from the filling and cook until everything is hot. – Add the cream and heat until piping hot. 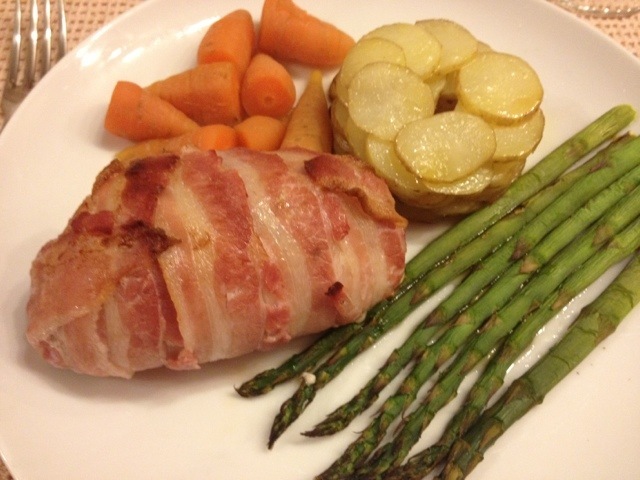 – Season to taste then serve over the stuffed chicken thighs. 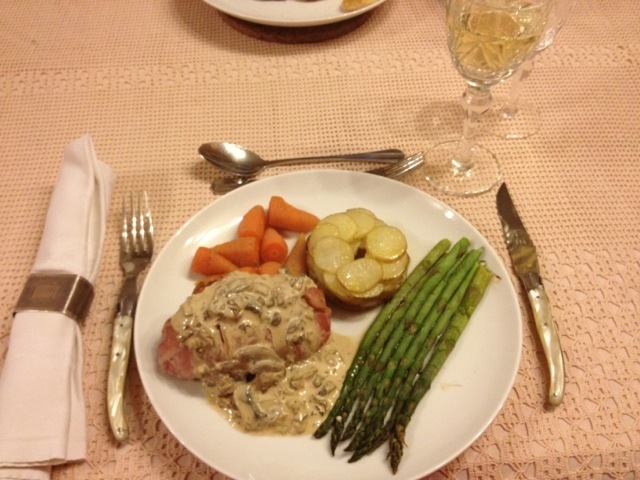 I served them with pommes Anna, grilled asparagus, chantenay carrots and a nice Chablis!